Katsushika Hokusai, (葛飾北斎), (1760—1849), was a Japanese artist, ukiyo-e painter and printmaker of the Edo period . In his time he was Japan's leading expert on Chinese painting. Born in Edo (now Tokyo), Hokusai is best-known as author of the woodblock print series Thirty-six Views of Mount Fuji, (c. 1831), which includes the iconic and internationally-recognized print, The Great Wave off Kanagawa. 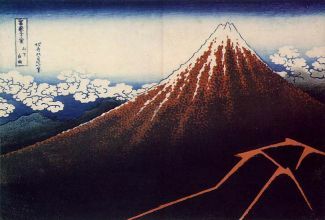 Hokusai created the "Thirty-Six Views" both as a response to a domestic travel boom and as part of a personal obsession with Mount Fuji. 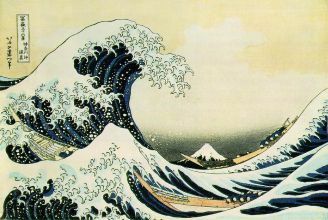 It was this series, specifically The Great Wave print and Fuji in Clear Weather, that secured Hokusai’s fame both within Japan and overseas. As historian Richard Lane concludes, “Indeed, if there is one work that made Hokusai's name, both in Japan and abroad, it must be this monumental print-series...” . While Hokusai's work prior to this series is certainly important, it was not until this series that he gained broad recognition and left a lasting impact on the art world. Indeed, it was The Great Wave print that initially received, and continues to receive, acclaim and popularity in the Western world. Hokusai is considered one of the outstanding figures of Japanese woodblock printing, sometimes referred to as ukiyo-e.